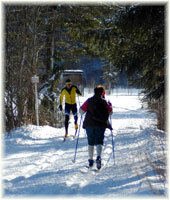 Lodging in North Conway, NH Bed and Breakfast in the Beautiful White Mountains. The Wildflowers Inn, A Victorian Country Inn in Northern New Hampshire. 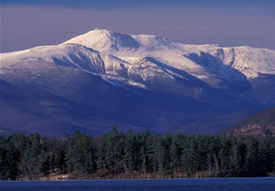 Located in North Conway in the Amazing White Mountains of NH. and we'll help plan your vacation! The Wildflowers Inn Featured in the September issue of New Hampshire To Do Magazine! We will be closed for vacation from March 31st thru April 30th. Please email or use "contact us" above and we will respond by email. 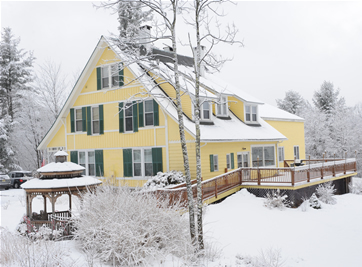 Your host Bob and Emily invite you into their home to enjoy the views and warm hospitality that Wildflowers Inn in North Conway, New Hampshire. Sit on our large deck or in our breakfast room and marvel at the views of Mount Washington, one of the great mountains of America. This Country Inn was Built in 1878 on a hillside in New Hampshire's beautiful Mount Washington Valley overlooking the Saco River basin, the Wildflowers Inn commands exceptional panoramic views of the valley and Mt Washington. Wildflowers Inn is a haven for those who appreciate nature and exceptional hospitality. 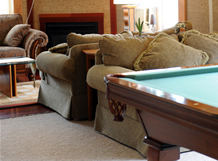 All rooms have: Private Bathrooms, Fireplaces, Cable HD LCD (19”) TV (DVD player available), Air Conditioners, and WIFI. Take full advantage of the spectacular views while enjoying a full country breakfast on our sun porch, relaxing in our library, or enjoying a game of pool or watching our 42” HDTV in our great common room. We are a non-smoking inn, but you are free to smoke outdoors!